There are no giant hotels in Hydra because of the island's traditional nature which makes it against the law to build anything new. You can only restore existing buildings. But there are a number of smallish hotels in historical buildings. The Cotommatae Hydra 1810 (photo) is housed in a 19th century mansion with a stone-paved courtyard, it offers traditional accommodations with free Wi-Fi. Originally a wealthy sea captain’s mansion built in 1810, the Hotel Miranda is a fine example of characteristic local architecture. It is close to the port and features uniquely styled rooms, some with old hand-painted ceilings made by Venetian artists. They are all air conditioned and offer garden or sea views. The Bratsera is a converted sponge factory in the middle of town. The hotel is like a sponge museum and is full of antiques, photographs and yes... even some sponges. It has a beautiful swimming pool that looks like it came straight out of ancient Greece and a cafe-restaurant and a large room that can be used for workshops, dance, yoga or small conventions. Of course it has air-conditioning which is very helpful in August. There are several other hotels and all of them are nice and you will be just as happy in any of them. It just depends on how much you want to spend. 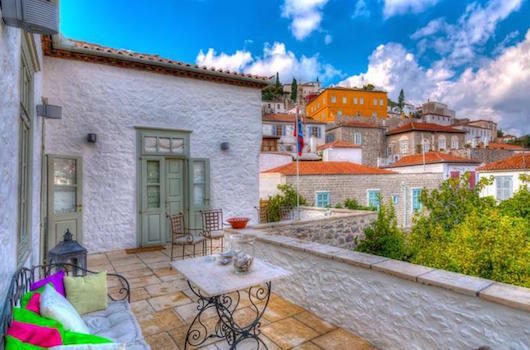 The family-run, traditionally built Kirki Hydra (photo)is in the center of town, just 150 feet from the port and offers air-conditioned accommodations with a private balcony overlooking the town or the garden. Boasting magnificent views overlooking Hydra, the recently renovated Hotel Hydra offers guests the choice of 8 tastefully decorated rooms, most of which have panoramic views of the island. The Sidra Hotel is a family run hotel in an old mansion conveniently located just 50 meters from the port. Another old mansion, the Hotel Mistral is just a 3 minute walk to the port and the swimming rocks and has a beautiful view of the sea. The Hotel Angelica is a VIP Boutique Hotel with a lovely garden and spectacular rooms decorated in the historic Hydra style. For more economy minded travelers the Hotel Hydroussa have doubles for under 100 euros as does Katerina's Home. 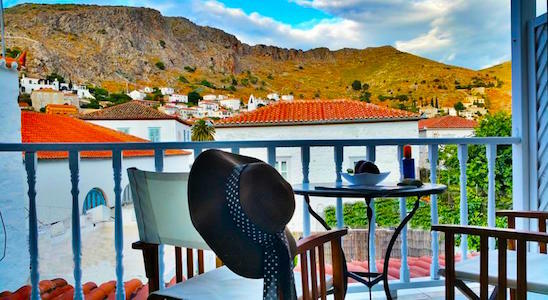 Situated 150 metres from the port and the centre of Hydra Town, the refurbished Hydra Icons features themed rooms of world famous artists and a terrific view. Set in an historic house on a hill above the harbour, Hydras Chromata offers a garden and air-conditioned apartments or a villa with furnished terraces and free WiFi access. The 18th Century. Artist's Villa is exactly what it sounds like, an air-conditioned, traditionally decorated vacation home for those with deeper pockets. 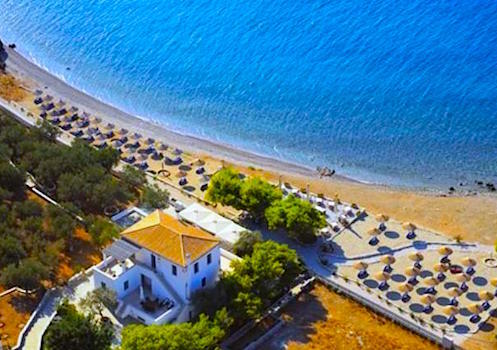 If you want to be outside of town the very highly rated Four Seasons Luxury Suites Hotel is on the beach at Vlichos and has a very nice taverna so you don't even need to go into town, though I don't know why you would not want to. The hotel has free wifi, satelite TV and the rooms have the options of sea or mountain view. And half the fun is getting there by boat, foot or donkey since the port is about 2 miles away. Another option for those who want to stay outside of town are Kiki's Houses, just a few steps from the beach. The Villa Mandraki has self-catering accommodations with furnished verandas and magnificent views of Mandraki cove. 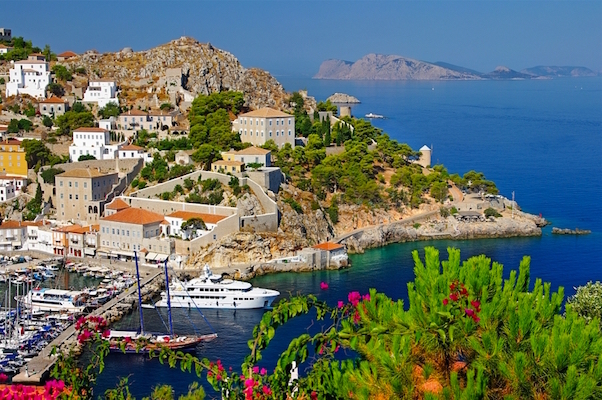 The beach is a few steps away and the town of Hydra is a 25-minute walk. For more Hotels in Hydra see Booking.com's Hydra Page where you can see photos, prices, reviews and book in many cases with no cancellation fee. By the way...if you are coming to Hydra in June, July or August or over Easter book early because since there are few hotels and they fill up quickly. If you try any of the above hotels and you find most of them are full on the dates you need and finally find one, book it. Chances are next time you look it won't be available.